The first church was built in 1895 complimented with a log-hewn rectory, only twenty feet square, built in 1896. A new rectory was constructed in 1919 and stood until it was replaced with the present day building in 1958. 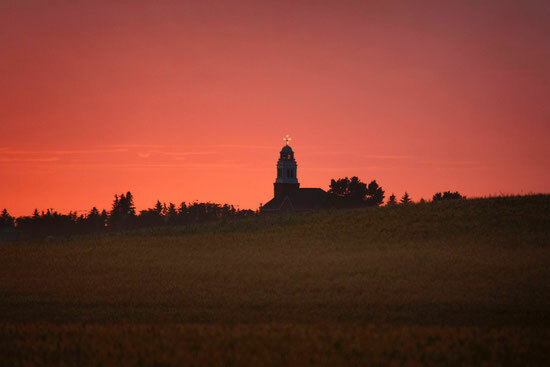 Monsignor Vital Grandin, Bishop of St. Albert, contributed one third of the land for a church site, which was chosen by Father Albert Lacombe in 1894. 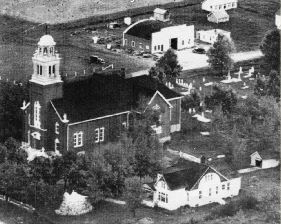 A small, simple church was built and Beaumont's own Roman Catholic Church celebrated its first mass on June 30, 1895. The parish’s first priest, Father L. Poitras, had the privilege of presiding. Tragedy struck on the night of February 10, 1918 when the church was destroyed by fire. However, determined parishioners, with the supervision of a new priest. Reverend J.A. Normandeau, began building a new church shortly after. The cost was approximately $30,000.00. As no machinery was available, the church’s basement was hollowed out by horses pulling scrapers. Five hundred loads of sand were brought in, three hundred of gravel, six hundred of rocks, and fifteen hundred bags of cement. Everything except the cement was furnished and transported by the parishioners free of charge. The lumber and bricks were brought from Leduc. Huge tree trunks were installed to form the buildings foundation. These tree trunks were replace in 2002 by steel beams. After months of labour and devotion, the new church held its first mass on July 4, 1920. In November of 1921 parishioners made their church complete by adding a two thousand-pound bell to the bell tower. It was blessed and named "Marie Vitaline" in recognition of the church's patron saint. The approximate cost of the church was $30,000 not including the digging, transportation of materials, and the voluntary work of the parishioners. The Cross of Jacques Cartier was erected in 1934 under patronage of the French Canadian Association of Alberta. By sponsorship of the Children of Mary, the Grotto of the Blessed Virgin Mary was built in 1935. The statue of “The Sower" was purchased in 1938. In the 1880’s there lived in the Beaumont area, a First Nation's band called “Paspascchase.” They numbered approximately 200. As of 1887, the band was gradually dispersing, for individuals and families were leaving their treaties and joining surrounding tribes. It was at this time, the wish of the Paspascchase, that the reserve was sold to other residents of the province and the funds transferred to a neighboring band, where the majority of the families chose to become members. The spring of 1892 marked the opening of the railway, and the first contingent of immigrants started to arrive. It wasn't until 1895 that this French Canadian colony was named Beaumont which means beautiful hills. Father Morin traveled to Ottawa to petition for a post office. With this petition he presented a list of suggested names to give the community. In relating to history of Beaumont, we must emphasize the influence of the Church in its development. After the opening of the West of colonization, a number of agents worked towards establishing colonies in order to develop this immense part of the country. Among these agents were a number of Catholic priests whose aim was to group together the French Catholic families who were searching for a better future than the one they could anticipate in Quebec. For this reason, those colonization agents organized excursion to the West. The people had great faith in the priest and therefore were willing to follow him to the land of hope. The first group of settlers migrated from Quebec.